Instagram | If Not Now, When? I think we all agree with the title to this post. One of the wonderful things about necessity is that it forces us to look at things from a different perspective as to solve a problem or create something we need that doesn’t already exist. That is where this list comes in – hacks. Many of these hacks you probably already know if you are an old buffalo in the TN world but maybe some of you are new and these will help you hack your TN. I pieced together, from my own ideas to many wonderful blogs out there, a selection that may make your planner world happier place. Double up your elastics for a tighter closure on your TN. Need more elastics? Check out this shop on Etsy. There are dozens of other shops and many TN shops also sell it. Cover a binder clip with washi, add leather and create a movable pen clip that can be a placeholder as well. I use one of mine to hold my place in my weekly calendar. Cut the large post-its tablet in to a TN size pad. I used an exacto knife and straight edge and made sure I purchased the super sticky notes. Now you have movable pages in your TN. Fold a clear document sleeve in half for a clear pocket. Loop leather or cord through top strand elastic for a place marker, tie the ends with charms. Always check your favorite planner/supply shops and see if they have blogs or Instagram accounts. Often they will have specials and giveaways that they will only advertise on them but not on their shop site. Don’t have an Instagram account? It is very easy to set one up here. Use graph paper to make inserts, cut to size and use card stock for cover to make it more durable. Don’t have graph paper? Go to incompetech.com/graphpaper and print your own for free. Use templates and file folders to make TN folders. I like double stick tape as my adhesive. Cut file folders to use as covers for inserts, they are durable and come in a zillion designs. Make an ArtDori with Peerless watercolor sheets, water brush pens and watercolor paper. Take #10 size envelopes, cut various lengths and stack, using double stick tape for adhesive. Trim the base envelope to 8.5″. You have instant storage. Use double stick tape to stick to the back inside of an insert. Use washi tape to section off Hobo style insert pages. Use a passport wallet for portable supply storage. 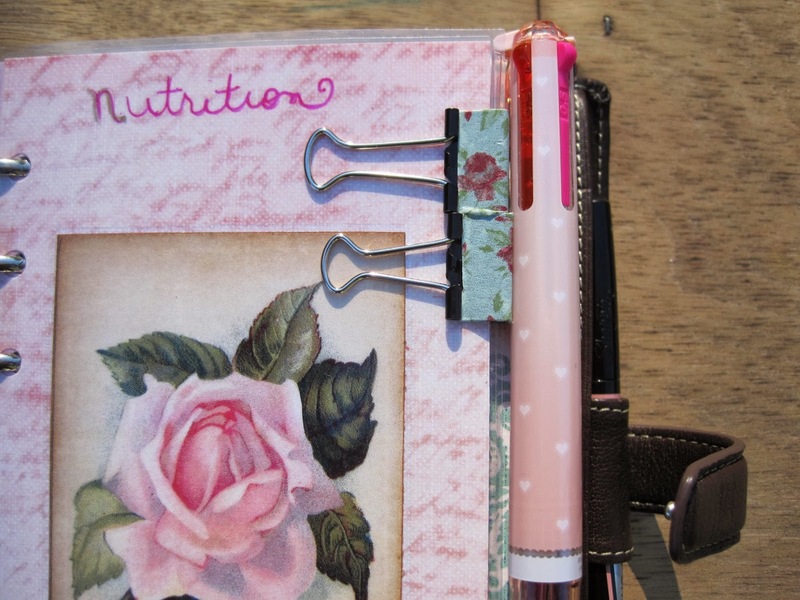 Want a cute, inexpensive way to carry supplies? Check out Forever 21’s makeup bags and brush wallets. Color code pages by edging them with different color washi’s. Try using a bullet or symbol system in your TN for your calendar, notes, to-do list. Linked is Ray Blake’s FREEBIE! Put a note in the beginning of your book that you will give a reward if your TN is found and the way you would want someone to contact you if they found it. Create a mindmap when you need to brainstorm. They are fun to do, beautiful and function and functional. Create and keep a list of abbreviations in an insert that are specific to your family, life and work. Soon you will have your own shorthand. Use a binder clip as a pen holder this way. Take off the wire parts to make it more streamline. Need tear-out sheets for some reason? Get a rotary perforator like this to make tear-out pages. You can perforate the pages on the long edge, then in smaller sections horizontally. If you have your own hacks…please share them in comments for everyone! I am very excited about our next giveaway. We are getting close to another folllower milestone and I am close to a milestone in my career. The blog is growing by leaps and bounds and I am getting read to launch a class on Self-Care that I have been developing for quite a while. In honor of those two things the giveaway has to be good! Up for grabs for one lucky follower is a faux-dori, regular with extra room, four strands, double strap, in genuine leather. This isn’t just any faux-dori, this one isn’t for the faint of heart because the leather has a beautiful pattern on it that will bring attention to it….I’m not going to say more – yet….how do you get in on the drawing? Simply be a follower of my blog AND my Instagram – yep that easy! Links to my Instagram on the right. Thank you to all of my followers for being a part of my blog. The deadline for entry is April 20th. The Dori shown is not the prize, it just illustrates a typical regular faux-dori with extra room. Send me a Message if You are a Vendor or Shop on Instagram….. I am on my Instagram account several times a day and see such a huge benefit to it for vendors and craftspeople who are trying to promote their work. If you are a vendor or have a shop and would like your Instagram account listed on a post I am putting together about top 100 Instagram accounts for planner/office supply/midori lovers/addicts please send me a contact me with your info about your shop and your Instagram account name. I would love to include your shop and promote it for you! If you know of someone who doesn’t read my blog but has a shop they would like included let them know and ask if they would like to be included in the list.